Biomolecule Labeling - Bio-Synthesis, Inc.
Biomolecule labelings have a variety of biological functions, such as cell signaling molecules, tools in molecular biology, drugs in medicine and countless other roles. These small, low molecular weight organic compounds such as labels, tags and probes, can be attached to macromolecules via appropriate linkers, macromolecules including antibodies, antibody fragments, enzymes such as alkaline phosphatase and horseradish peroxidase, proteins, peptides and peptidomimetics, oligonucleotides and analogues, ligands, polysaccharides, avidins and streptavidins, polysaccharides, simple and complex lipids for use with immunochemistry, fluorescence in situ hybridization (FISH), cell tracing, receptor labeling, cytochemistry applications, probing biological structures, functions and interactions and also conjugation of biotin and other haptens to biomolecules. Bio-Synthesis has expertise in synthesizing new small molecules, modification of existing molecules and advising clients with appropriate methods for activation of small molecules, labeling and conjugation of the small molecules to biomolecules. Our conjugations routinely employ heterobifunctional coupling chemistry, which allows the greatest flexibility in achieving product requirements. As one of the pioneers of Synthetic Biology Service Company, Bio-Synthesis aggressively seeks to develop new technologies to assist clients in developing new bioconjugate reagents for their sensitive detection applications. Prices vary based on the project specifications. The list price is for reference only. 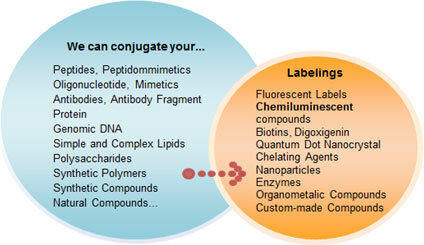 Our services include materials and labor for conjugation only! Price does not include the cost of biopolymer synthesis and, if deemed necessary, biopolymer modification to introduce additional functional groups, extra linkers, and/or spacers. Please contact us for a quote. Coupling of preactivated small molecules and biomolecules with chemical reactive groups such as amine, thiol, carboxylate, hydroxyl, aldehyde, ketone, active hydrogen, photo-chemical and cycloaddition reactions, zero-length cross-linking, homobifunctional, heterobiofunctional, or multifunctional cross-linking chemistries, dendrimer and dendrons and cleavable regent systems. Fluorescent, nonfluorescent, redox labels, qdot, enzyme labeling, metal chelators and other small molecule labeling. All custom synthesis of biomolecules, modification or bioconjugation services are manufactured under strict quality control (QC) processes. Analytical HPLC and MS analyses are performed in every development cycle. Final target conjugates must first be isolated from excess or unreacted reagent. In many cases, simple dialysis may suffice to remove unreacted reagent from the reaction solution. Depending on the project scope, size-exclusion chromatography (SEC) or HPLC may also be used to either remove excess reagent or to isolate and characterize the cross-linked product. The cross-linked target molecule may then be further characterized by biochemical or biophysical techniques. Once the product has been purified, it may be subject to various characterization methods including spectrometric (MALDI-TOF, ESI, LC-MS), fluorescence, electrophoresis, and immunochemical, biochemical and enzymatic analysis. QC (quality control) and QA (quality assurance) procedures are also followed independently to ensure the highest quality possible. Moreover, our dedicated technical account managers will guide you through every step of the process and keep you informed of the latest progress. The typical delivery consists of a lyophilized sample in an individual, fully labeled vial. The shipment also contains COA, MS HPLC and/or other analytical data. Additional analytical data is also available upon request. Small molecule labeling generally refers to any form of cross-linking or modification whose purpose is to conjugate a chemical group (e.g. fluorescent and chemiluminescent compounds, redox labels, biotins, haptens, nanoparticles or user supplied compounds having target functional groups) with target molecules such as proteins, nucleic acids and other biomolecules through single, bifunctional or heterofunctional cross linkers to aid in detection. Choosing the correct cross-linking chemistry sometimes appears overwhelming, as it requires a careful understanding of target molecule structure and reactivity. These cross-linking and modifying agents can be applied to alter the native state and function of peptides and proteins, sugars and polysaccharides, nucleic acids and oligonucleotides, lipids and almost any other imaginable molecule that can be chemically derivatized. Therefore, Bio-Synthesis carefully designs each conjugation. Bio-Synthesis not only offers synthesis of small molecules and biopolymers, but also assists in the functionalization or activation of compounds ready to cross-link with pre-activated small molecules. These small molecules are either supplied by customers or prepared in-house. These pre-activated small molecules can be created with an amine, acid, hydrazine, aldehyde/ketone, hydroxylamine, maleimide/alkylhalide and sulfhydryl functional group in a polymer. Standard desalting, purification, quality check and final concentration and labeling ratio are determined, after labeling biopolymers with small molecules. User-supplied, non-commercial, small or macromolecules should be sufficiently pure (≥95% pure). Please provide the QC data (typically HPLC, MS, ESI or NMR data etc.) and MSDS (if any) along with your compound. We can assist with the purification and acquisition of analytical data. These compounds must contain functional groups that can be targeted for cross-linking including carboxylate groups, primary amine groups, aldehyde/ketone residues, hydroxyl, hydrazine, hydrazide, aminoxy, saccharide/glycan groups or thiol reactive functional group(s). Coupling can also be non-selective using a photoreactive phenyl azide cross-linker. If necessary, we can also assist with the creation and activation of specific functionalities. Any sample supplied by the client requires a quality check by our analytical team prior to conjugation. Commercially available small molecules can be supplied by customers or ordered through Bio-Synthesis. Common small molecules such as fluorescent dyes, biotin-NHS and other hetero-bifunctional cross-linkers are available at Bio-Synthesis. For in-stock compounds, Bio-Synthesis will charge customers the amount needed for conjugation. If the small molecules are to be purchased separately, the cost for acquiring this material will be added to the invoice, along with a $50 administration charge per order. We can custom synthesize small molecules in-house . A quotation will be prepared for such syntheses. Oligo or custom genes such as DNA, RNA and PNA can be synthesized and conjugated through amino, thiol or 5'-phosphate modifications. Oligos supplied by the customer should be HPLC or gel purified (>90% pure). Please provide the QC data needed for purity assessment. Extra charges may apply for analyzing the starting materials at Bio-Synthesis. Peptides and proteins can be synthesized or expressed in-house at Bio-Synthesis. We label or conjugate peptides through N-terminal, C-terminal or internal side chains of amino acids. Peptides supplied by the customer should be HPLC purified (>90% pure) and contain a single modification site. We can make any standard peptide with functional groups incorporated through peptide synthesis. Please provide the peptide sequence of the desired peptide on the order form. We offer post-synthetic modified ligands to be immobilized on various solid supports, which allow the immobilization process to occur selectively in the presence of common functional groups, including amines, thiols, carboxylic acids and alcohols. Bio-Synthesis offers functional group modification and derivatization. Every chemical modification or conjugation process involves the reaction of one functional group with another, resulting in the formation of a covalent bond. The creation of bioconjugate reagents with spontaneously reactive or selectively reactive functional groups, forms the basis for simple and reproducible crosslinking or tagging of target molecules. Our well-trained chemists assist clients from project scope collections to design and determine appropriate homobifunctional or heterobifunctional cross-linking chemistries. We have delivered thousands of custom conjugated biopolymers and are fully capable of meeting the ever-increasing bioconjugation needs in biological and drug discovery research. Hundreds of reaction systems have been applied in our organic laboratories. Custom synthesized biopolymers such as peptides and oligonucleotides from Bio-Synthesis are manufactured under strict quality control processes. We use mass spectrometry (MS) for all single custom peptides, oligonucleotides and purified biopolymers. We also analyze by RP-HPLC and other quality check methods are available upon request.